The discovery of Velcade® for the treatment of multiple myeloma (MM) originated from a collaboration with ProScript Inc. and NCI scientists, Drs. Edward A. Sausville and Jill Johnson from the Division of Cancer Treatment and Diagnosis, Developmental Therapeutics Program. NCI has supported and continues to fund research on the structural and biochemical complexities of the proteasome, as well as clinical trials on Velcade® and various drug combinations. In 2006, the FDA approved Velcade® as treatment for multiple myeloma patients whose cancer did not respond to conventional treatments or came back after initially responding to treatment. 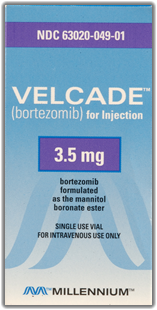 In 2008, the FDA approved Velcade® as an initial treatment for patients diagnosed with MM. Velcade® is being clinically tested against ovarian, colon, pancreatic, lung, and prostate cancers, as well as leukemia and non-Hodgkin's lymphoma.